Kholajali Pitha is origin to Noakhali district of Bangladesh. It is literally rice flour crepe (Gluten free) which is traditional cooked on clay pan and with duck egg. But non-stick thick bottom pan and chicken egg will work well. If you are using store bought rice flour, please make the batter and let it sits for 1-2 hours before you make the pitha. 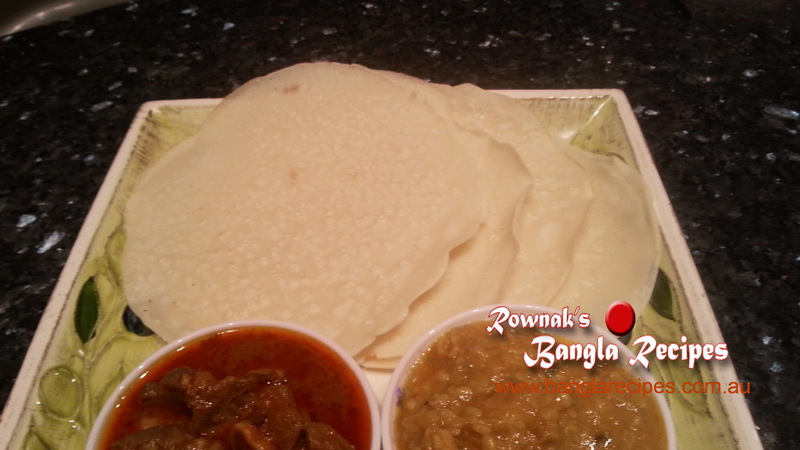 This pitha is a simple and easy alternative of rice flour bread. In some places it is also known as “kholajan pitha” or “Kholaja Pitha”. N.B. Thanks Urmee Sultana and Tanzina Alam for boot dal and meat curry. Also needs oil to wipe the pan. Mix rice flour, lukewarm water and salt together to make batter. The batter should be in finely dripping consistency, neither thick nor very thin. Add egg and beat again. Beating part is very important to perfect pitha. Heat the clay pan and when the pan is hot enough, wipe it with oil. Pour ½ -3/4 cup batter on it and rotate the pan to cover the surface and to give round shape with the batter. Cover it up and when it is cooked, with a spatula remove Kholajali pitha from the pan. 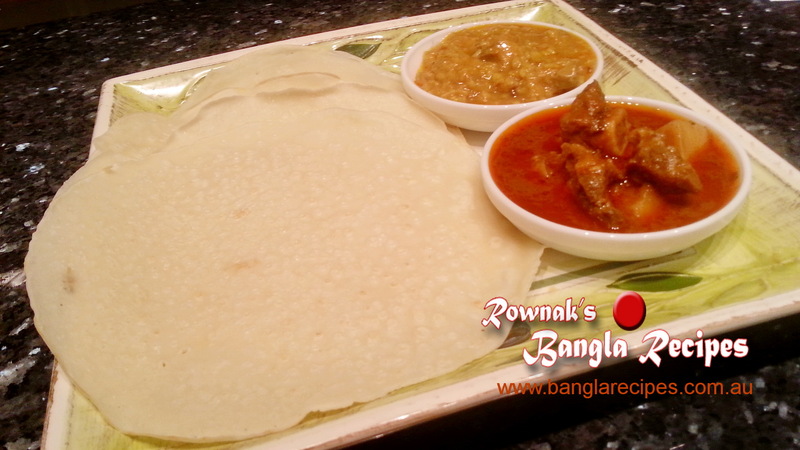 Enjoy Kholajali pitha with meat curry or boot dal.